Kenwyne Jones and substitute David Healy grabbed the goals as Sunderland extended their unbeaten run to four matches at the expense of 10-man Stoke. Jones broke the deadlock with 15 minutes to go, rising at the back post to head in Andy Reid's cross. Matthew Etherington was sent off for the visitors for kicking out at Black Cats defender Danny Collins. Healy sealed the win when he latched on to a Jones cross and slotted his shot under Potters keeper Thomas Sorenson. Sunderland chairman Niall Quinn revealed in the matchday programme that the Black Cats would be slashing season ticket prices for next season in the hope of maintaining their fan-base in difficult economic times. While the prices may be an incentive, for the most this game was an inadequate trailer in which to entice the home faithful. Stoke have never won at the Stadium of Light and without the suspended Rory Delap, their chief weapon, they battled hard but offered little to suggest they would break their duck. Sunderland had the first chance after six minutes when Stephen Kelly gave the ball away to Jones whose strike on goal was crisp but poorly directed straight at Sorenson who palmed away, and Reid could only fire the follow-up well over the bar. Stoke responded three minutes later with Glenn Whelan delivered a free-kick that caused confusion in the Sunderland area before Richard Cresswell's spectacular overhead kick flashed inches wide. Both teams are well-staffed with physically imposing players in defence and attack and both sought to outmuscle each other in the respective penalty areas. Within the first 25 minutes Stoke had made all of their three substitutions as a result of injuries. Firstly, Danny Pugh came on for Andy Wilkinson, then Ibrahima Sonko for Ryan Shawcross and, finally, Ricardo Fuller was replaced by debutant Henri Camara after falling awkwardly and damaging his shoulder. However, the changes initially appeared to be of greater benefit to the away side as the tempo was slowed to a crawl. 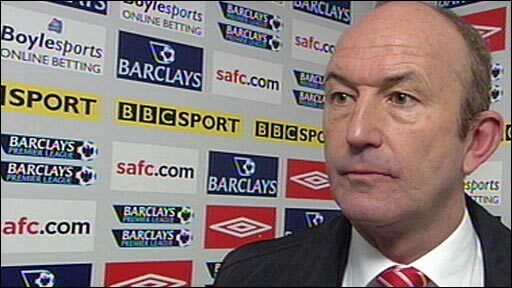 Regardless of what happens today Pulis must address the terrible record we have for players getting booked and sent off! Sunderland regained their composure though and had two attempts cleared off the line, one more controversially than the other. Reid crossed to the far post where Steed Malbranque was lurking, but his header was prevented from crossing the line by what replays proved was a clear handball from Pugh. Black Cats players and fans appealed vociferously for a penalty but were turned down by referee Rob Styles. Minutes later, Collins' shot cleared the static Sorenson but full-back Kelly was on hand as the last line of defence to head the ball away to safety. Shortly after the hour Etherington was needlessly sent off for kicking out at Collins after the two had tussled for the ball. A minute later though, Stoke should have taken the lead when Whelan floated in a free-kick that eluded the Sunderland defence before falling to Camara who inexcusably struck the bar from six yards out. As the home side sought to capitalise on their numerical advantage, Djibril Cisse and Carlos Edwards both flashed volleys wide from similarly tight angles having both been supplied by Reid. The home side did eventually make the breakthrough with 15 minutes remaining as the impressive Reid floated a pinpoint cross to the far post for Jones to bundle a header past Sorenson. The goal floored Stoke, and Healy, who had only been on the pitch 10 minutes, provided the decisive knock-out blow four minutes into injury time when Jones cut the ball across goal for the Northern Ireland striker to slot in. "If one of my players was sent off like that I'd fine them. It was undisciplined and you can't afford to lose players in games. It was the right decision. 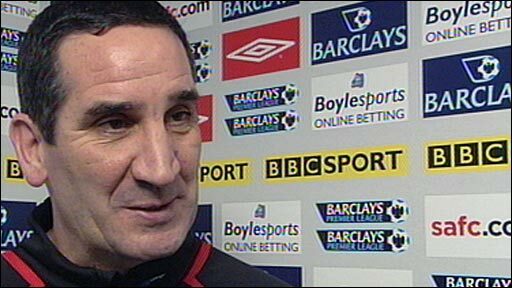 "Kenwyne is still getting fit but he's a handful and he got the goal he deserved today. "Today was really important for us. We needed three points to give us the cushion because we've now got two really difficult games away from home." "I don't think it's a red card. If use a little common sense I don't think that's a sending off. He's not injured the player, he's not booted him in a violent way. "It's very easy for referees to make decisions like that against some of the clubs that aren't as big as some in this league. "Mr. Styles has not been very good to this football club over the years so whether we'll get a chance to appeal I don't know. "We don't ask for any more, just the same as what other clubs get. "What I'm disappointed with is that there have been certain incidents where we've done exactly what other people have done and we get punished really severely for it." Sunderland: Fulop, Bardsley, Ferdinand, Collins, McCartney, Malbranque (Edwards 70), Whitehead, Richardson, Reid (Murphy 82), Jones, Cisse (Healy 86). Subs Not Used: Gordon, Ben-Haim, Leadbitter, Davenport. Goals: Jones 78, Healy 90. Stoke: Sorensen, Wilkinson (Pugh 18), Shawcross (Sonko 26), Abdoulaye Faye, Kelly, Cresswell, Whelan, Diao, Etherington, Fuller (Camara 30), Beattie. Subs Not Used: Simonsen, Olofinjana, Lawrence, Kitson. 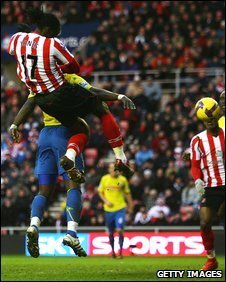 BBC Sport Player Rater man of the match: Sunderland's Kenwyne Jones 8.56 (on 90 minutes).